So I have yet to find a person who doesn’t like something that is “chicken-fried.” Chicken-friend steak, chicken-fried pork, chicken-fried chicken. Because, let’s face it, anything that is fried is pretty darn good. So it isn’t surprising that I love chicken milanese (or milanesa). It sounds fancier, but is basically a Latin-American version – same concept as wiener schnitzel or chicken fried chicken. You beat the chicken, dip it in egg, then in breadcrumb mixture, and then fry or bake until golden brown. This is a good simple milanese recipe I got from Cooking Light. I figure if Cooking Light says I can have something fried, then it can’t be SO bad. I am sure there is a better recipe out there that has more butter, more oil, etc., but for a healthy recipe, this is a clear winner. I also suggest making the salad and orzo with it. 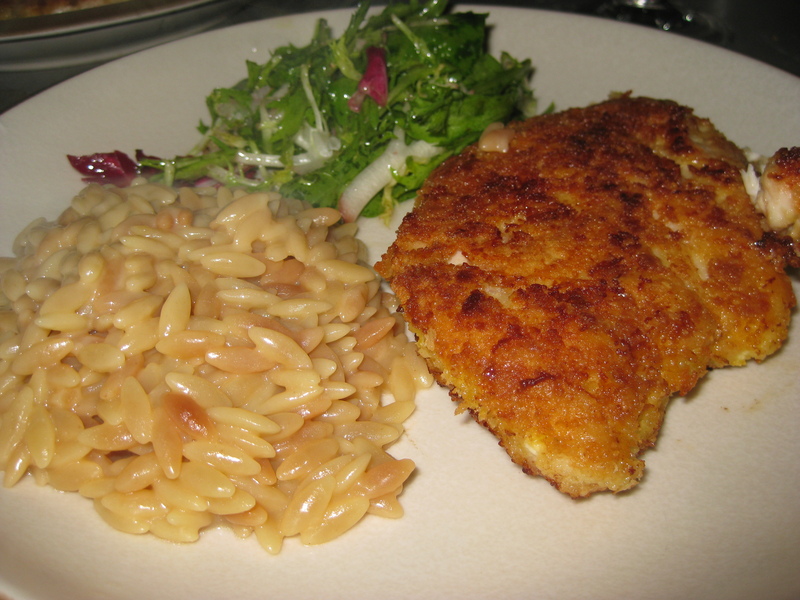 The orzo is rich and creamy compared to the crunchy and juicy chicken, then the salad has a bit of tang and lightness to finish off the meal. Combine juice, vinegar, shallots, 1/8 teaspoon salt, and sugar; let stand 15 minutes. Place chicken between 2 sheets of heavy-duty plastic wrap; pound to 1/2-inch thickness using a meat mallet or small heavy skillet. Combine breadcrumbs and cheese in a shallow dish. Place flour in a shallow dish. Place egg white in a shallow dish. Sprinkle chicken with 1/8 teaspoon salt and 1/8 teaspoon pepper. Dredge chicken in flour; dip in egg white. Dredge in breadcrumb mixture. Place chicken on a wire rack; let stand 5 minutes. Heat 1 tablespoon oil in a large nonstick skillet over medium-high heat. Add chicken; cook 3 minutes. Turn chicken over; cook 2 minutes or until browned and done. Add 2 teaspoons oil and 1/8 teaspoon pepper to shallot mixture; stir with a whisk. Add greens; toss gently. Place 1 chicken breast half and 1 cup salad on each of 2 plates. Serve with lemon wedges. Cook 1 tablespoon butter in a small saucepan over medium-low heat 4 minutes or until browned. Add 1/2 cup orzo; cook 1 minute. Add 2 tablespoons white wine; cook over medium-high heat 1 minute. Add 1 1/4 cups chicken broth. Bring to a boil; reduce heat, and simmer 13 minutes. Stir in 1 tablespoon grated Parmesan; cover and let stand 5 minutes. Sprinkle with 1 tablespoon chives. This entry was posted on May 4, 2010 at 7:16 pm and is filed under Chicken. You can follow any responses to this entry through the RSS 2.0 feed. You can leave a response, or trackback from your own site.